Crude inventories fall by 9.6 million barrels in the last week, compared with analysts' expectations for an increase of 309,000 barrels. 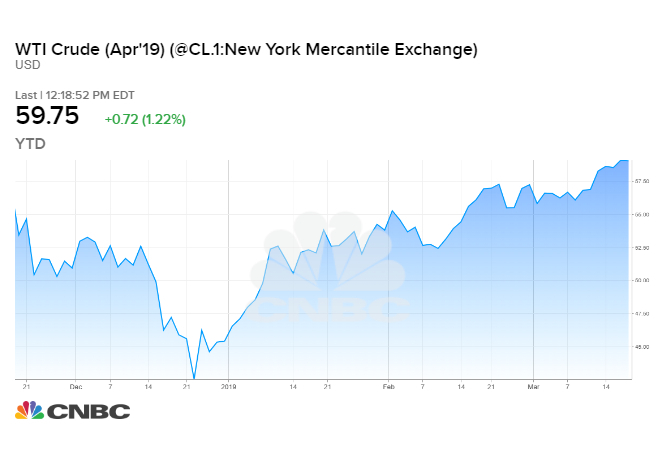 U.S. West Texas Intermediate crude futures settled 80 cents higher at $59.83 per barrel, after earlier topping $60 and hitting its highest level since Nov. 12. The more heavily traded WTI contract for May delivery peaked at $60.28 a barrel. Brent crude futures rose 89 cents, or 1.3 percent, at $68.50 a barrel. The international benchmark for oil prices rose as high as $68.57, setting a new high going back to Nov. 13. Overall, the EIA report was "pretty bullish," with gasoline demand rivaling consumption during peak season, said John Kilduff, founding partner at energy hedge fund Again Capital. "You've got to believe we're due for a Trump tweet at some point, but I think with demand, these drawdowns, and the refinery snags we've been having, it's kind of a bullish setup," he said. Crude futures have drawn support this week from OPEC's ongoing supply cuts. On Monday, the group canceled a meeting planned for April because it expects the oil market to remain oversupplied through the first half of the year. Morgan Stanley believes the output curbs, along with U.S. sanctions, will soon push the market into undersupply and support Brent prices at $75. "Conversations with several OPEC officials left us with the impression that Brent in the mid-$60s is not where the cartel would like to see it," the investment bank said in a research note Tuesday. "We assume that OPEC will extend – or even deepen – production cuts to support the oil market at the next meeting in June." Surging U.S. crude production and exports are keeping a lid on prices. The nation's output is holding steady around an all-time high 12.1 million bpd, while weekly exports hit nearly 3.4 million bpd, just below a recent record, EIA said. The oil market rallied into Wednesday's settlement along with equities after the U.S. Federal Reserve left interest rates unchanged and indicated it would not raise rates again this year.